Any side with a name like Hush Puppies is BOUND to be good, especially when it comes from down South. 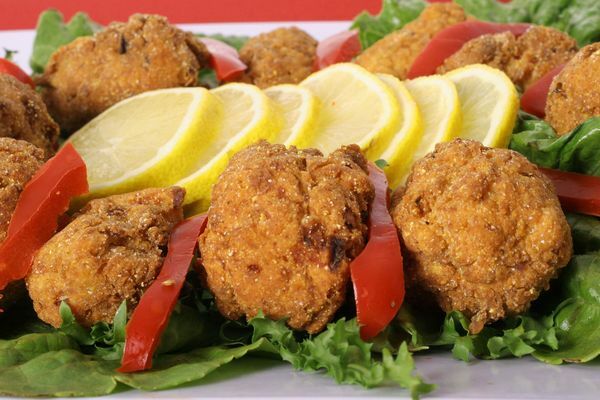 These cornmeal-based fried balls of goodness first got their name in 1899 when hunters and fisherman along the coast first began making them and feeding them to their dogs to “hush the puppies”. The name stuck, and so do did the basics of the dish: cornmeal, buttermilk, butter, onions, and occasionally some bits of fish, crab, or sausage. 2. Now take a slightly smaller bowl and combine the milk, buttermilk, eggs, and chopped onion. Pour wet mixture over dry ingredients and stir together until just they began to form a mix. Set bowl to the side for 30 minutes. 3. In a deep-fat fryer or dutch oven, heat about 2″ of oil until it reaches 360 degrees F.
4. From here, scoop out a large spoonful of the mixture and dip in to the dryer for two minutes. Depending on your fryer, flip or rotate to ensure the crust is dark and brown and even. Repeat this, doing multiple at a time as room permits. Remove each and place on a few paper towels to remove the remaining oil.